Eight people are congregated in a stagecoach stopover (resting place for people on long journeys in stagecoaches) seemingly by a coincidental snowstorm in the northern part of the USA sometime in the 19th century- years after the American civil war. But the owner of the stopover is missing and someone else is temporarily in charge of the stopover. And all of them seem to be violent people with guns. Everyone has some story to tell about himself. Two of them are bounty hunters (people who capture or kill people wanted by the government) with their bounties; some bounties are dead and one is alive. One claims to be the newly appointed sheriff of the town. By their own admission or by others telling of their deeds, we come to know that many of them have done rather inglorious things that might have brought them disrepute in the past. And while one of them is a black man (Samuel L . Jackson) many of the others hate black people as their all too frequent use of the N word for blacks clearly indicates. The use of the N word frequently in a film is a Quentin Tarantino (director of the film) hallmark by now . So is it mere coincidence that such characters have been assembled at the same place at the same time? Or is it something else? Something is not right about the whole setting. The first half is not violent but still there are enough indicators of oncoming violence. And violence or no violence, it is still interesting. The conversations are peppered with funny dialogues as the movie goes on in a self mocking tone. The lone surviving bounty who is a female (Jennifer Jason Leigh) seems to be too quirky to be real . But the real fun is reserved for the second half where the proceedings explode into violence when they are not getting outright depraved- both the violence and depravity being Quentin Tarantino hallmarks. Guns boom with the regularity of firecrackers during festivals, blood is spattered all around and the twists and turns in the fighting keep the audience rooted to the seat all along. You don’t know who is going to fire next and you just have to wait and watch . One thing is sure, their is not a single likeable character in the situation, thus justifying the title of the film. But that is what is likeable about the film. I hadn’t come to see any do gooders anyway. Mean people doing mean things is what I had come to see-the meaner the better. And I got what I wanted to be sure. Fighting was rarely more glorious. While writing I realised that I was reviewing a western for the first time. The atmosphere of the American west in the 19th century has been created in so many films before but none in a snowstorm. And the howling winds outside give a different background to the proceedings. Photography is good and background score is decent too. 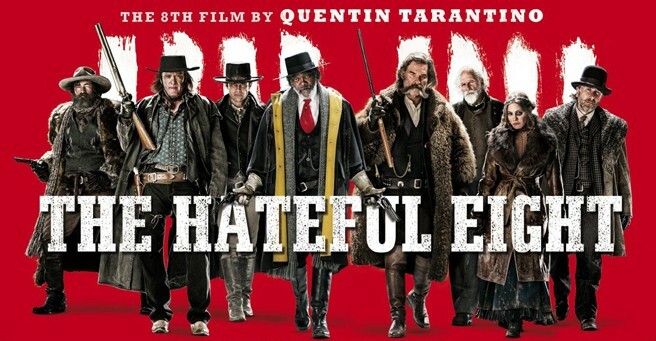 Without too many special effects and on a relatively lower budget Tarantino makes great films. And once more he has come out with a winner.